What is the age requirement to live at St. Ann’s? The minimum age is 62 years. Do your apartments come furnished with kitchen or kitchenettes? No. Our residents enjoy the freedom from meal planning. Included in your rental price are three home-cooked meals per day plus snacks and refreshments offered at all of our activities. The meals are prepared in our central kitchen and served in dining rooms overlooking Lake Superior. We prepare, serve, and clean up after all of your meals! Residents may have a refrigerator, coffee maker, microwave, and toaster in their apartments. An electrical fee applies for residents who have small refrigerators, and or microwaves. What is the difference between St. Ann’s and a nursing home? We offer independent and assisted living for seniors and we offer assisted living for seniors who require some nursing assistance. 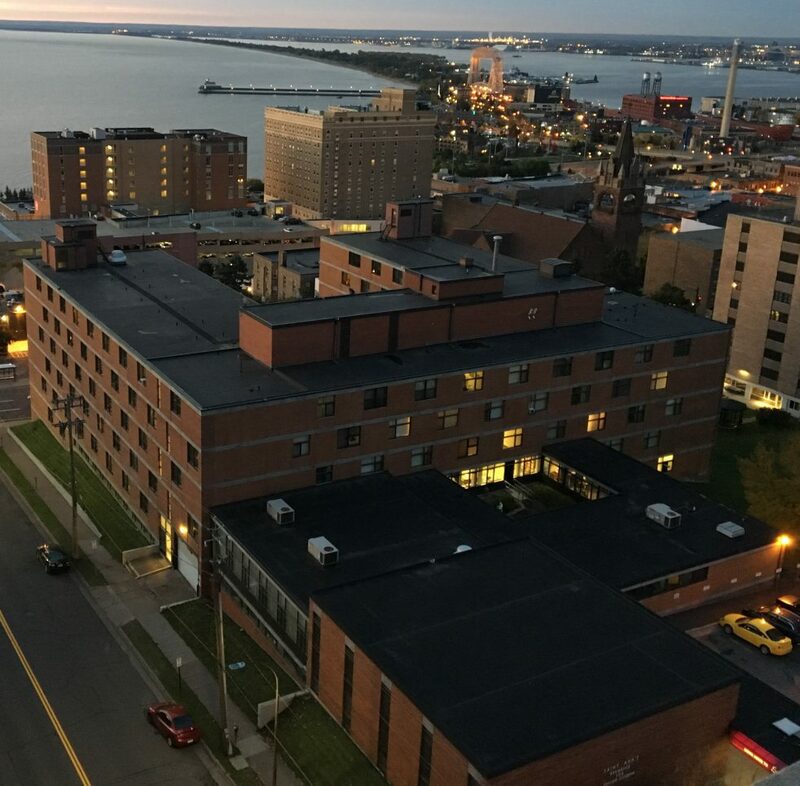 If residents are admitted to the hospital for surgery or sickness, they may go to a rehab facility before returning to their apartments at St. Ann’s. For residents who need some assistance, we offer a number of cares options that are customizable for each resident. Or, you may choose to have your own care provider come to your apartment. Yes! We love pets! This is home for our residents and pets are just as much an important part of our lives as our other loved ones. Please ask about our pet policy. Included in your base rental price is, of course, rent for the apartment, along with satellite TV service, unlimited phone service, weekly basic housekeeping, utilities, and three meals served daily at breakfast, lunch, and supper. Is St. Ann’s owned and operated by the Catholic diocese? No. St. Ann’s was founded by the diocese and managed by the Benedictine Sisters for many years but is now independent from the diocese, is nondenominational, and is overseen by a secular volunteer board of directors. We welcome people of all faiths, or people of no specific faith at all. What apartments are available for Section 8 housing assistance? Our average studio apartments are available for Section 8 housing assistance. You can apply for housing assistance right at St. Ann’s. We do not bill Medicare or Medicaid. Some insurance policies may provide coverage, but you’ll have to consult with your insurance company or give us a call and we can check for you. We do bill Elderly Waiver, however, through St. Louis County and Medical Assistance. Is St. Ann’s able to accommodate special dietary needs? While we cannot specifically accommodate everyone’s personal dietary needs, St. Ann’s offers a variety of meal options and foods that allow our residents to make healthy, responsible choices based on their needs and on their doctors’ recommendations for their diets. Our assisted living community serves meals restaurant style. Our Food Service manager and our nursing staff will be happy to sit with you and your family to help you choose foods from our menus, to the best of our abilities. Residents are welcomed to purchase other products they may need and keep them in their personal refrigerators in their apartments. Are the apartments at St. Ann’s furnished? Our apartments are partially furnished, if desired, to include a bed frame, nightstand, and TV stand. All of our apartments have built-in dressers and desks and each apartment is fitted with blinds and carpeting.